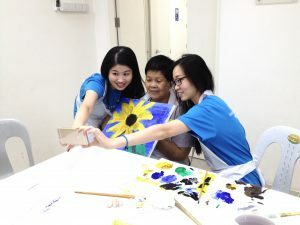 In our art canvas workshop in Singapore, you will learn how to create a unique masterpiece to call your own. Under a pre-set theme, you will be guided towards creatively imagining 1-2 objects and subjects that are related to the theme (e.g. nature). 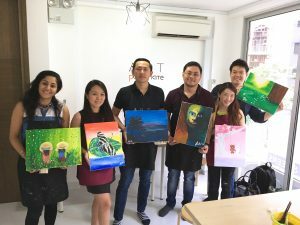 Combining your imagination and acrylic painting techniques such as color mixing and layering, your artwork can be anything you want it to be—from patterns of repeated shapes, surrealistic landscapes and impressionism animal art! 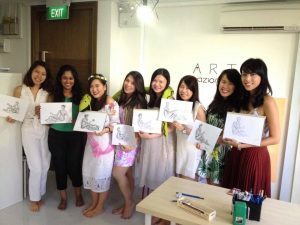 At Art Pazionate, our canvas painting art workshops can be customised to your needs. Canvases can be joined to form a big painting for group sessions. A popular global art form, paper quilling art is found in renowned galleries across the United States and Europe. One of the most well-known paper quilling artists in modern times is Russian artist, Yulia Brodskaya. Her original artworks are owned by renowned individuals and institutions such as Oprah Winfrey, Ferrero, San Francisco Museum of Modern Art, Country Music Association and more! Will you be our very own Yulia Brodskaya? 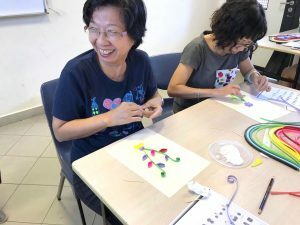 Craft like the famous paper quilling artist and join our paper quilling art workshop in Singapore where you’ll learn to create amazing, intricate pop-up designs by shaping paper quills into various shapes such as Marquis, Teardrop, Curved Square and more! 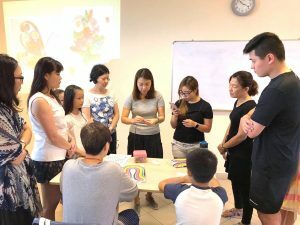 Our paper quilling art workshop will also cover advanced techniques such as crafting 3-dimensional miniature sculptures out of paper quills of varying thickness. 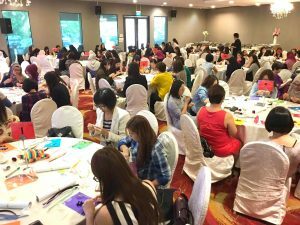 Our paper quilling art workshop in Singapore is great for corporate team-bonding events, too! 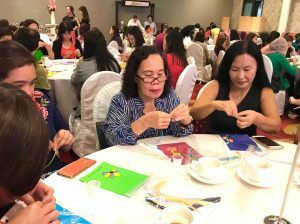 Challenge your colleagues’ paper quilling art skills and you will be amazed at how creative everyone can be. 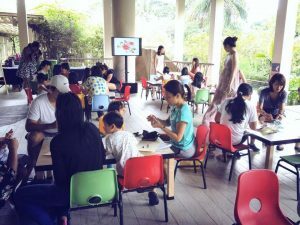 In our Lino Art Workshop, you can expect an engaging time of carving and designing you own prints! You will be guided on the application of Lino tools and essentials such as cutter, brayer, ink and more. Carve almost anything ranging from abstract patterns to whimsical objects and animals. Make as many repeated prints as you can with our colored inks and cards provided. You will get to bring home your very own unique carved block for more DIY printing on papers and even fabrics. Read our blog to find out more about lino art! 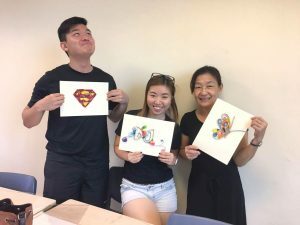 If you have little or no experience in art, Tote Bag Painting + Stenciling workshop could possibly be the ideal option for you. Stenciling is a fun and therapeutic activity for everyone. Put together your creativity and a few stencils, and stencil them away! You will learn to layer your design and organize your stencils for stenciling on Tote Bag (approximately A4). Watercolor art is trending on Instagram whether you realize it or not! Get involve to create this intriguing art with Art Pazionate. This Fashion Watercolor Illustration workshop is great for those who love watercolor or fashion. You will learn the essentials of creating your own fashion illustration from body anatomy to tonal values and color mixing. Have Something Else In Mind? Speak To Us About It Today!